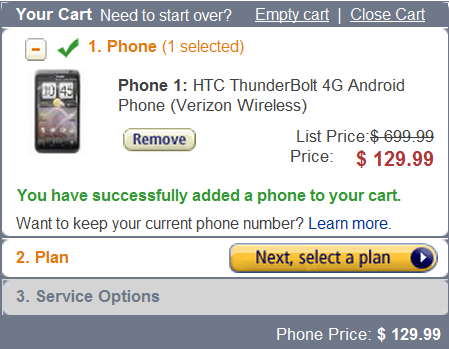 Been holding off from purchasing Verizon’s first 4G LTE phone, the HTC Thunderbolt? We (and our readers) would like to point out that Amazon has the device on sale right now for $129 which is one heck of a deal. Now, you have to remember that almost all of these online phone retailers have strict rules after activating, so if you go this route, try not change anything on your plan for 6 months or so. Still, a great deal.